Somewhere deep in her mind Christine Marsden is witnessing the murder of young girls.And now she has urges to hurt her own children. After a head injury which leaves her having nightmares and visions, Christine is convinced that something inside her brain has broken, and that she is slowly sinking into insanity. She is terrified of what she might be capable of. She fears that in losing her mind she will also lose her children and husband. Christine embarks on a desperate fight to try to halt the fracture of her mind before it’s too late, and in doing so, discovers the hidden truth behind the dark horrors she is experiencing. Inheritance is a #1 Best Seller on Amazon UK's Top 100 free Psychological Crime, Mystery & Suspense Thrillers. 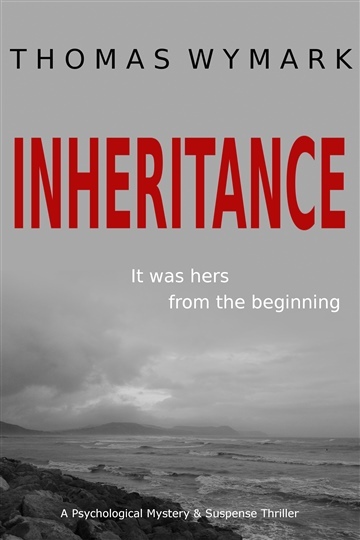 A copy of Inheritance is downloaded somewhere in the world every 3 minutes! Mystery and Suspense Thriller writer. Born in London - now living near Brighton. The author of stand alone novels, short stories and the Sal Smith mystery thrillers. Visit www.thomaswymark.com for all my books.